Note the new venue address above. Solo Bass Night 4 was at the old location. or at the Freight & Salvage box office. notified about any changes to this event and to receive a reminder in April. 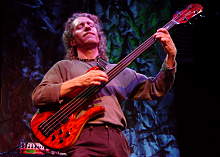 Grammy nominated bassist, composer and two-time winner of Bass Player magazine's Player of the Year, Michael will headline the evening with a set of his ground-breaking original compositions, improvisations and ingenious transcriptions. 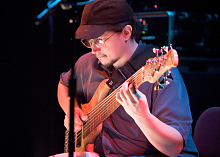 Jean Baudin, known for his unique, dark, melodic compositions and versatile technique, is one of the world's most recognized bass players. The renowned bassist has performed solo bass shows and taught at clinics across the US and in Europe, including some alongside bass legends Stu Hamm and Michael Manring. Austrian Ariane Cap is a multi instrumentalist, educator and composer. 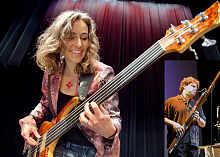 An eclectic and versatile bassist she has covered many styles, from Jazz, to Folk and Flamenco (Muriel Anderson), to classical music (The Mozart Band), African (The Palm Wine Boys), Celtic (Tempest) to Punk Rock (The Sippy Cups) and Cirque du Soleil. Ariane also performs a bass solo program using loopers and effects and has recently teamed up with Bassoonist Paul Hanson to create the eclectic duo OoN. She is currently working on several recording projects featuring her own music as well as writing books on her teaching methods. Paul Hanson is a Bay Area-bred world-renown jazz bassoonist and saxophonist known for his diverse career with artists such as Bela Fleck and the Flecktones, Cirque Du Soleil, DAVKA, St Josephs Ballet, Zenith Patrol, The Klezmorim, Paul Dresher Ensemble, Jonas Hellborg, Dennis Chambers, Eddie Money (sax soloist on "Take Me Home Tonight") and Boz Scagg . 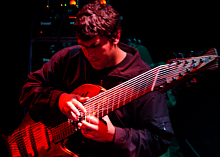 Dave Grossman specializes in 7-string electric bass arrangements of the solo violin and solo cello works of J.S. Bach. He has also done some live looping and other original music. Dave used to play with the instrumental rock trio (unpronounceable).